Sketchbooks?? No, not really. The books are more of an expression of my interest in marking time…of a participation in a daily ritual. Inspired by the date paintings of Japanese artist On Kawara, I begin a project in 2010 that involved writing each day's date in an experimental calligraphic style. This project evolved to include the making of book pages with the date and words and phrases of poetry. The pages became a kind of daily play. Some months I made marks only; other months I introduced collage bits with words. On another occasion I did all the work with my left hand. At the end of each month the pages were bound into a book - a Book of Days - and a collage painting was created for a cover. The longest standing ritual in my life (at lease 40 years) has been my morning newspaper and coffee at a North Beach Cafe. I decided to combine the Cafe and page-a-day rituals. A new series, Cafe Chronicles, was born. 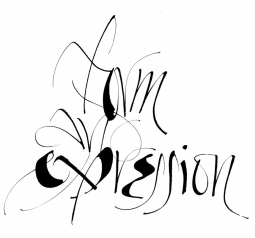 However as opposed to calligraphic play I began to draw. It wasn’t necessarily my desire to make recognizable the people that I drew. A reasonable facsimile of something looking like a person,was satisfaction enough. Page composition has been more of a focus. By sometimes adding words to the pages, I explore word/image relationships, which are an important part of my formal art work. And, as with the Books of Days, I try each month to do something the change the direction of my drawings. Adding watercolor to drawings, or beginning drawings with an abstract water color image are examples of this. But mostly I enjoy participating in the process and watching it evolve.